RapierCon – A Great Con as Always! This past weekend was spent at RapierCon down in Jacksonville, Florida. It’s a semi-regular trip I make to meet up with old friends and to meet new ones. I make this short trip (4-hour drive) about every two years and I always enjoy this convention. This year was no different, but before I get into my highs and lows of the convention, let me lay out what Rapier is. Rapier is organized by the Jacksonville Garrison; it’s a local gaming club. 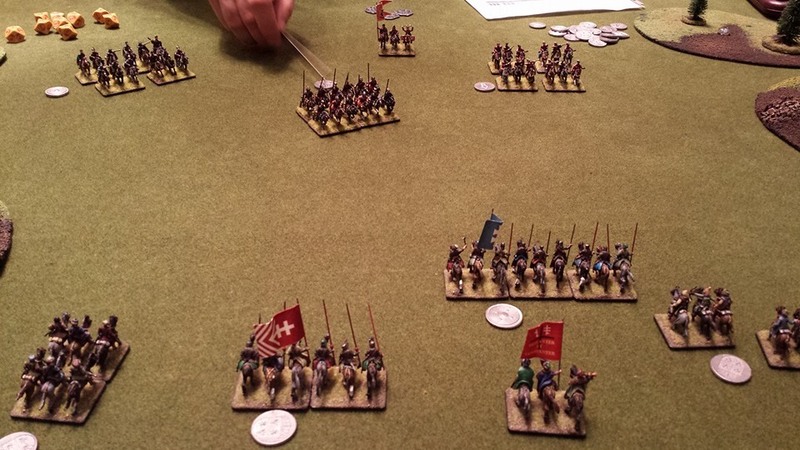 The convention started as a purely a historical miniatures event, but has blossomed and diversified over the years; 2015 marked some milestones for Rapier. This year’s RPG offerings were record setting in terms of both the number of games offered and the diverse nature of the offerings. This year also saw a much heavier presence of boardgaming over miniatures gaming, but don’t be fooled there were loads of miniatures games happening all weekend. Unofficially, I place the attendance level between 225 and 250 guests. This is a small, but well-organized machine of a convention. There are lots of things they do right and very little if anything I could say they do wrong. They have the organization and execution of a convention down to a science. We arrived in the late morning and were shocked by the recent hotel renovations. Two years ago the hotel was in horrible shape and since then Double Tree bought the property and completed renovations. A very nice change indeed and the air condition worked and it worked very well! Enough about that, we got checked in at the registration desk and I scoped out where my first game was going to be run at 2 pm. Yes, this year I volunteered my time to run two different RPGs. Friday’s game schedule was pretty packed for such a modest event. I was also surprised to see that boardgaming had taken over the main ballroom and the miniatures games, for the most part, were up on the 6th floor; though there were some exceptions to this rule. For context, in years past, boardgaming was a newish addition to the event and usually relegated to offshoot room(s) for the most part. At 2 PM I was set up in the “Tombstone Frank Suite” to run my game of No Country for Old Kobolds by Steven Wallace and I was bummed out that only one person showed for the game. Now, I speculate until the cows come home about why only one person showed up, but I think it can be summed accordingly. It’s a little-known indie game and a lack of advertising on everyone’s part. I could have done a better job of promoting the game and the session in the weeks leading up to Rapier. Convention organizers could have done a better of advertising individual games and events through social media. Though the website did include very robust descriptions for almost every game. I spent the rest of Friday afternoon and evening hanging out with old friends and shopping at the fleamarket. This year I made several cool purchases at the fleamarket. I scored a 2e AD&D Player’s Handbook, 1e AD&D Dungeon Masters Guide, 1e AD&D Greyhawk Adventures and Pendragon: Tales of the Spectre Kings. I also picked up a 6th printing of OD&D Gods, Demigods and Heroes from a vendor. Come 8 PM, my son, now 13, was off to play his first convention RPG game without me. A wonderful milestone for him! He played A Song of Ice and Fire: The Game of Thrones Edition by Green Ronin Press. With him fully involved in the game, by wife kept an eye on him while I took the opportunity to talk with folks, have a drink and then I called it a night early. Saturday was a very busy day for me! I was up early and re-reading the rules to Fiasco. Fiasco was the second game I was running at the convention. This game was scheduled for 9 AM and I am happy to report it went off without a hitch. I had two people show up so, we played a three-person game of Fiasco. The playset I choose was Salem 1692 and what a hell of a witch trial it was! The game took just under 3 hours to finish and everyone had a great time! Just before the afternoon session I wondered by the By Fire and Sword vendor and saw they only had one rulebook left so I was compelled to pick it up and some miniatures too. Mind you I have never played this game nor had a demo of it, but a Charleston friend who was there as well raved about the game. Let’s just say $197 later I was off to the 2 PM game session. Saturday afternoon I had the opportunity to play September’s Eagles by High Flying Dice Games, but the best part was I got the chance to play with son. The game’s theme was late 1920s and early 1930s airplane racing. Sadly, I overtaxed the capabilities of my airplane and those of my pilot, ultimately running it into the ground in front of the grandstands at the end of the first lap. Of the four players, my son came in second of the two surviving planes. I was a little skeptical of the game at first, but I can say I really enjoyed it. The rules were rather intuitive and easy to understand. Given the opportunity, this is something I would pick up in the future. The best part was playing it together with my son! 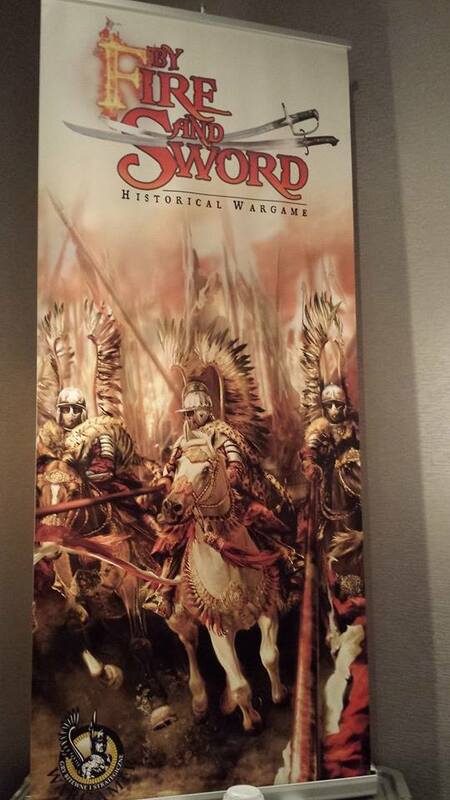 After getting knock out of the air race, I finally got a demo of By Fire and Sword, a relatively new, at least to the US, miniatures game that focuses on 16th century Eastern European warfare. What an amazingly simple, yet robust rule set. I know this was only the demo, but we played several turns before I had to run off to dinner. It was robust enough of a demo that I was able to experience all of the basic rules and several of the more advanced rules. The rulebook itself is a work of art and wonder to behold. I will be writing more about this game in the weeks to come. At 7 PM I met with local Indie+ gamer and Dr Tom the Frog‘s production monkey, Rich Rogers. Rich and I have gamed together a few times online and I was also interviewed on the Dr. Tom the Frog show a few month back. Rich and I chatted and wandered the dealers for a little while. He was able to score me a ticket to the 8 PM Goonies game (Savage Worlds RPG). While we waited for the game to start a young lady was bummed she couldn’t get a seat in the game so I gave her my ticket. I was bummed to not game with Rich, but I was happy the young lady was able to play. All the while my son reported for his 8 PM game of Britannia by Fantasy Flight Games. I passed the rest of the night by chatting with vendors and gamers alike. 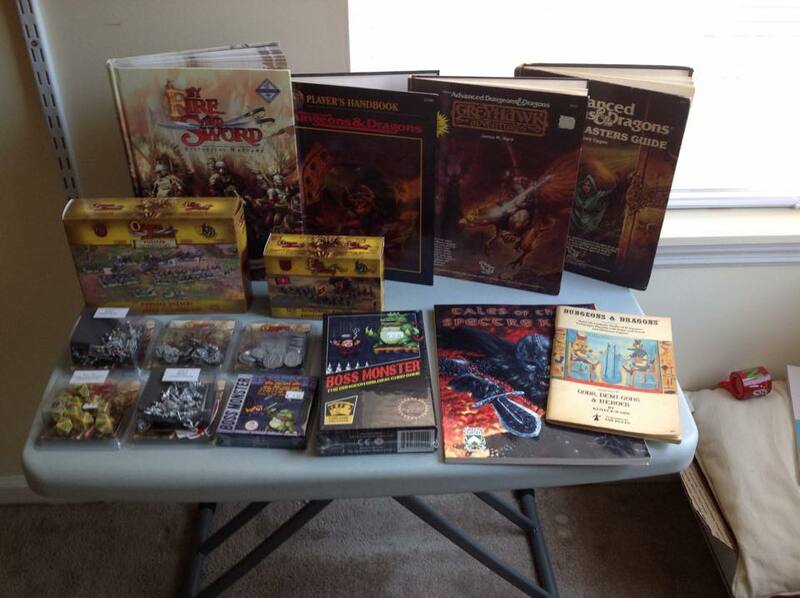 Hell, I spent more on miniatures and even got a copy of Boss Monster for my son. The night ended at about 1 AM in the morning. Sunday morning, my son and I scheduled ourselves for a session of the recent Kickstarter game, Fief. 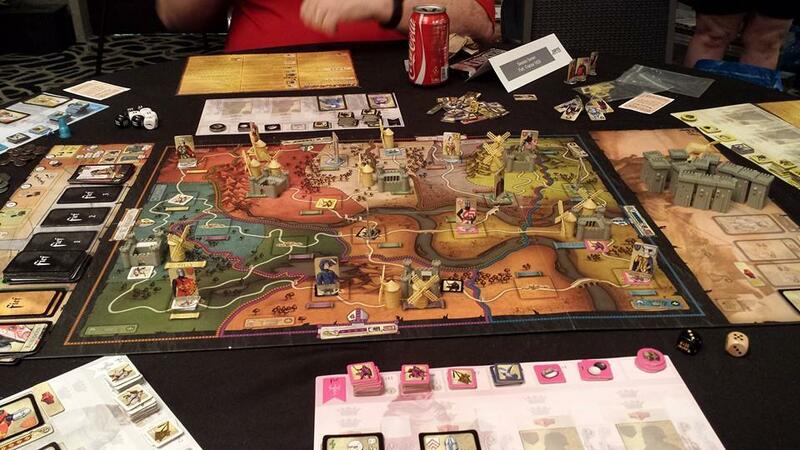 Fief was an awesome game of politics and land grabbing. I was pleasantly pleased with the how the rules worked so well and were not overly complex. Don’t get me wrong, there were plenty of rules questions and discussion about particular rules, but overall the game played exceptionally well and this will be one of the rare few games I would definitely add to my collection. Unfortunately, we were not able to finish the game, we would have needed about an hour more to finish, but our session was out of time and I needed to get on the road back to South Carolina. As always I had a great time at Rapier! Hands down, this is an awesomely organized event and one I will continue to attend in the years ahead. I hope to see continued diversity in the schedule and some attendance growth with their continued efforts to diversify. For less than $500 (hotel, meals, travel expenses) my family of 3 was able to have a great time and my wife, the non-gamer, was able to do some shopping in town. A smaller family can, of course, attend this event for considerably less! For potential gamemasters, one thing to beware of, Rapier does not comp registrations for running games. They have consistently gotten enough volunteers that they don’t need to offer comped registrations. Just something to aware of. That being said, they get lots of volunteer gamemasters to fill the schedule but are always looking for more. I have to give a shout out to Mike Jones and Neil Edge for doing a fantastic job of organizing and overseeing the “Edge/Jones Ballroom”. They did a great job of keeping boardgamers playing games and running demos, teaching, dealing with logistics hurdles, etc. They had help from some of other folks as well. These two are top notch in managing a boardgame area! Want to buy PDF of some of the RPGs mentioned above? Please follow these link to make your purchase. Your purchase helps to support the Rolling Boxcars blog. Previous Post RapierCon This Weekend!